Ken acquired this End Spring Square Box Buggy from Frank Coffman, his neighbor. Frank had been using it as a show piece in his front yard. Frank bought the buggy from a party in Sheridan Ill. Ken had the buggy restored in 2013. The seats and folding top are new. The wood and metal fittings were reconditioned and refinished with oil based outdoor paint. Black leather button tufted cushions seat two. Solid axels front and rear are mounted to two transverse leaf springs front and rear for a comfortable if somewhat bouncy ride. Apparently, no one thought to dampen the springs with shock absorbers? The folding auto top served mostly to screen the sun as it provided little protection from rain or snow. The box is made of wood and has space for some cargo behind the passenger seat. Iron fittings and the frame for the folding top are painted black. The box is finished in a shade of rustic brown with cream colored accent decorations. The large spoke wheels are also finished in cream color with orange accented pin striping making for a very attractive appearance. The business top buggy was used to transport one or two people The American buggy, whose general design evolved from an earlier pleasure wagon, became one of the most popular carriages of all time. It was a most common vehicle, popular in both town and country for shopping, business and pleasure riding. The name is synonymous with the Piano-Box Buggy except the Piano-Box Buggy has rounded corners. 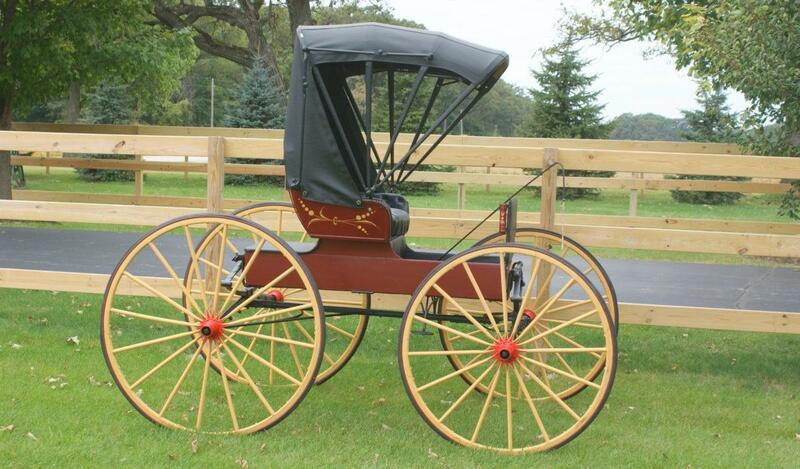 Buggies are often confused with the “buckboard” wagon. Buckboards were meant to carry a greater cargo load than the lighter buggy. And as such, the main platform between axles is not suspended by springs like a carriage, instead they are connected directly to the box. Even though the driver’s seat was supported by springs, the configuration made for a very rough ride on all but the smoothest surfaces. The Carriage and Buggy were important modes of short-distance transportation and especially important between the years of 1815 and 1915. During that era, horseback riding in rural areas was less common and required more skill than driving. Horsemanship skills were more for the aristocratic American and British landowners. Until mass-production of the automobile brought reasonable prices that the working-class could afford, a horse and buggy was the most common and reliable means of transportation. The era of the carriage and buggy in America is shorter than one might think. It is easy to get the impression from movies and photographs that the common mode of transportation in early America was the horse and buggy and that seemingly everyone had one at their disposal. Not exactly. Nothing but crude carts and farm wagons were built in the “American colonies” until the mid-Eighteenth Century. The most popular carriage of the early Nineteenth Century was the one-horse or road-wagon, later to be known as the buggy or runabout. It was a time when The Industrial Revolution in America was spawning a moneyed carriage class and New York city was at its center. By 1856 it was estimated that New Yorkers drove nearly 20,000 private fashionable carriages. Manufactures of carriages and buggies numbered in the thousands producing at least 58 distinct types of horse drawn vehicles. The Brewster Company of NY was the preeminent manufacturer of carriages and coaches for the rich and famous. Their story in some ways illustrates the transition from horse drawn carriages to gasoline engine powered automobiles. In something less than 20 years (1896 -1916) automobile production surpassed horse drawn vehicle production. A distinguished New Yorker once was asked for his opinion of the famous carriage building firm. Would you describe Brewster as “the Tiffany of the carriage business”? Not at all, he replied. “Rather, I would say that “Tiffany is the Brewster of the jewelry trade”, so magnificent and prestigious were their products. Sadly, The Brewster Company no longer exists but Tiffany is alive and well next to Trump Tower in New York City. At their peak of popularity, orders for custom carriages began to flow to Brewster in such quantity that the partners opened a new exclusive location across from the famous Delmonico’s restaurant. Their immense prosperity is reflected in the firm’s client list that included the titans of industry: John Jacob Astor, J. Pierpont Morgan, J. R. Roosevelt, Cornelius Vanderbilt, William Rockefeller and Presidents U. S. Grant and Abraham Lincoln. An order book entry in 1911 specified typical Brewster interior appointments: “a coat rail, memo book, cigarette case, scent bottle, mirror box, card cases, hat brush, flower vase and holder, watch, and rug.” The order was a harbinger of changing times as the adornments were meant for a bespoke automobile coach not a horse drawn one. The motorized age had overtaken Brewster & Company. Carriage-making continued but only for a few diehards and volume was lessening with each year. As Brewster forged ahead crafting incredible bodies designed to grace chassis supplied by some of the most exclusive automobile companies of the day, they initiated several automotive firsts that we take for granted today. Among them were the roll-up window, the folding inside “jump” seat, the sloping windshield meant to deflect light from the driver’s eyes and the hinged sun visor. The company was still highly profitable as Brewster became an agent for the English Rolls Royce chassis. The automobiles that emerged, one at a time, from the Brewster factory had the same impeccable mirror finish and unsurpassed craftsmanship as their carriages. But the future looked ominous. Even fine cars were being mass-produced now, at much lower prices. William Brewster was an artist and an able craftsman, a rare combination. The ability to visualize a beautiful form and to create in it a mechanical masterpiece was the very life of the man. The assembly line was heartbreak to him. “Willie had one last chance,” said Henry Brewster Hobson, his cousin and former chief engineer. He had an offer from Fisher to build bodies for General Motors on a production basis, but he just couldn’t do it. A body to him was not something that could be stamped out; it had to be felt, shaped and fashioned by human hands and carry some imprint of artistic creativeness with it and not be the predictable and inevitable outcome of an automatic machine. When Willie turned down the G.M. offer It was the end of the carriage era and the end of the Brewster Company. In 1925 Rolls Royce bought out the faltering Brewster Company. Gradually the wagons and horses began to disappear from the landscape. Having outlived their usefulness, wagons, carriages and buggies were often used as decorations, left to rot and rust in the back of farm lots or junked for their scrap value. Today these vehicle reminders of a by gone age are quite valuable. In both original and restored condition, they are not only prized for their nostalgic connection to the rich heritage that made our country great and fueled its explosive growth, but are also valued by collectors and historical preservationists. In a brief historical review of the transition from horse drawn transportation to motor driven vehicles it would be remiss not to mention the “engines” of the carriage and buggy era, the horses that supplied the get up and go. Just as there is a wide variety of internal combustion engines that power modern automobiles there was a wide variety of driving horses bred to be harnessed to wagons, coaches, carriages and buggies. Driving horses have a more refined conformation than the heavy draft horse that allows them to offer greater speed and agility. They often have powerful shoulders and hindquarters combined with a strong, broad back and thick mane and tails combined with an amiable temperament. Among the most popular breeds are: Cleveland Bay, Frederiksborg, French Trotter, Friesian, Gelderland, Hackney, Holstein, Nonius and Orlov Trotter. The horse population grew immensely and in parallel with the human population during the 1800s. In 1867, the rural horse population in America, estimated at nearly 8,000,000 grew to a peak of 26,493,000 in 1915, the year before automobile production overtook horse drawn vehicle production. It is worth noting here that the population of the US in 1915 was about 100.5 million people. If we were still a “horse and buggy” society today, with 350 million people our horse population would be close to 90 million. Imagine feeding and disposing of the waste from 90 million 1,500 pound animals! Certainly, posing a different kind of pollution problem than we face today. As automobiles and trucks became the preferred modes of transportation and commerce through the 1920s, horses disappeared at the rate of about 500,000 a year until only about 3 million horses could be found in the United States by 1960. Today the horse population in the US numbers about 6 million. No longer dependent on them as beast of burden, they are cherished for the sheer pleasure they provide. A chart of “Modern fashionable carriages and vehicles in general use,” 1893.